Use this stand to protect your amp by getting it off the floor. A perfect choice for various stage and studio amplifier applications, the tiltback feature will rest your gear on black velveteen rubber pads for the best grip and reinforcement of your sound. The A-frame construction makes this stand extremely secure and stable when holding equipment and gear. Non-slip rubber feet and a locking cross brace keep the stand, and your amp, firmly in place. Use the friction locking knob to quickly and easily adjust the shelf height to five different positions. Locking cross brace adds strength and support. 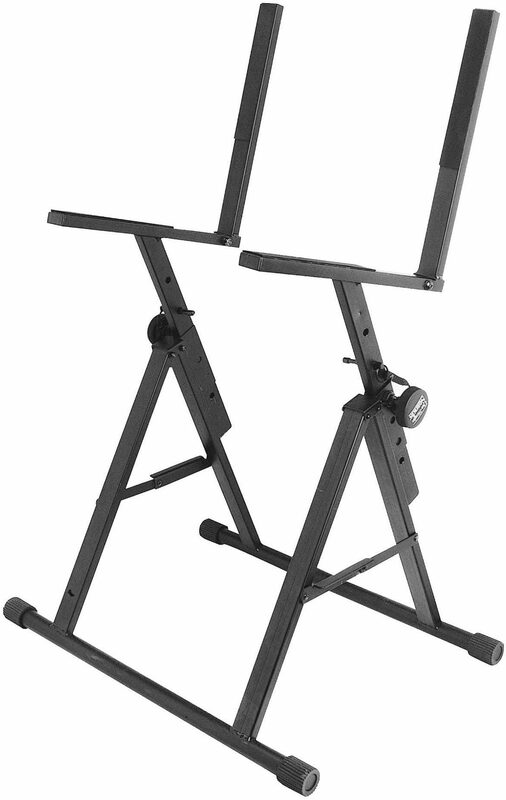 The single hinge allows legs to fold quickly and easily for travel. Padded support arms fold down for quick and easy storage. Entire stand breaks down into 3 pieces and will lay flat for storage and travel. zZounds is an authorized dealer of On-Stage products. Upper/lower arm length: 12 in. "Very sturdy and versatle. Great value." Sound: Great versatile, sturdy amp stand. I load up with a Fender hot rod deluxe and feel this stand is perfect for me. The only negative is that you can not get the amp level as it is designed to tip back on one of two angles. I like my amp level and compensate by laying a one by two strip of wood under the back edge. Anyway if you want something really rugged and versatle (up and down very adjustable) this stand is worth more than the $35 charged. 26 of 26 people (100%) found this review helpful. Did you? Thank you. Your vote has been counted. Could you briefly tell us why the review was or was not helpful? zZounds has verified that this reviewer made a purchase from us. "Great design for heavier amps and the quality is outstanding." Sound: It just sits there and makes no sound. Feature: It folds up nicely and the arms can be turned around depending on the weight of your amp. Ease of Use: Sets up fast. Tears down fast too. Quality: I have bought two of them. One for me and one for another member of our band as a Christmas gift. The quality of both were equally good. Value: You can't beat the price for this kind of quality. Manufacturer Support: Never had to call them. The Wow Factor: I might lust for a guitar or a bass but an amp stand....I don't think so. Overall: I hope it lasts my lifetime. 18 of 18 people (100%) found this review helpful. Did you?